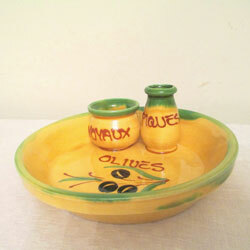 From the South of France, this ceramic dish is designed for serving olives. There are compartments for toothpicks ("piques") and for used olive pits ("noyaux"). The diameter is 6 1/4 inches.